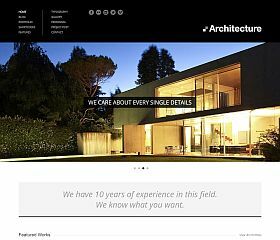 Architect is a theme with a beautiful, clean design that is flexible enough to meet almost any business’ needs. Set up with a full-width layout that incorporates parallax design elements, it features a handful of extras that will make your business stand apart from the competition. The Architect maintains the perfect balance of design, functionality, and professionalism to deliver a theme that will impress your clients. Built with the latest web features, the theme include: a responsive layout and design, optimized for speed and load time, built with custom post types, child theme included, unlimited color schemes, and an advanced theme options panel that allows you to easily customize your site to suit your needs. 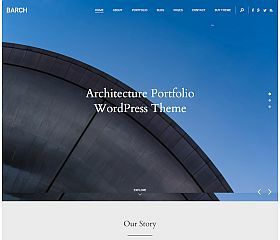 Architekt is a responsive and Retina-ready theme for WordPress was built to cater to the needs of architects and interior designers. Features include: multiple content sliders, unlimited color schemes to choose from, a drag-and-drop page builder for custom templates, minimalist icons, and a beautiful, unique overlay menu. 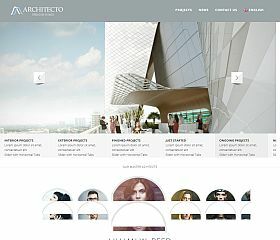 Architecto was built to serve the architecture industry, with a powerful and expertly-coded design that adapts beautifully to mobile devices (tablets, smartphones, etc) with a modern Retina-ready design. 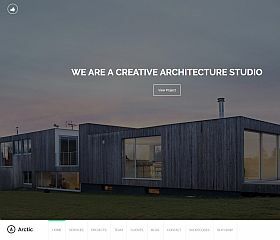 Architecture Studio is a modern, clean, HTML5 theme that features a responsive layout and professional design that will help you gain the trust of your visitors and land more business. Midtown Architects was designed for those in the architectural field. Included with this unique-looking theme you will find: a (sticky) right-hand navigation menu, responsive layout and design that is retina-ready, robust theme options panel, styling and support for the popular Contact Form 7 plugin, optimized for SEO with clean coding as well as HTML5 and CSS3, and more. 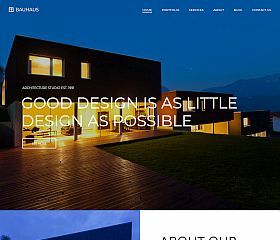 Bauhaus is somewhat of a multipurpose theme, allowing you to showcase your services, create a portfolio, and build a stunning website for your architecture business or content site. Whether you work in the residential or commercial side, an architect, drafter, engineer, or planner – this theme can adapt to suit your needs. It includes: multiple portfolio options/layouts (masonry, grid, etc. ), services area, full-width image background, content sliders, responsive and Retina-ready, and more. 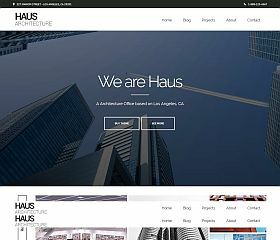 Haus was designed from the ground up with architects and architecture sites in mind. 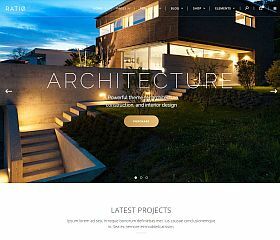 Whether you’re a one-man shop, a freelance architect, or a large architectural firm – this theme delivers all of the features and functionality that you might want to create a state-of-the-art website that you and your visitors will love. Melville is as much a work of engineering and design as the architectural content that it promotes. 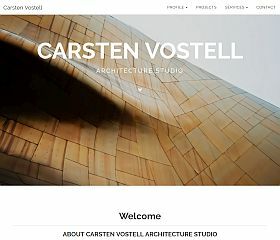 Perfect for architects or those in related fields, this simple, minimalist, and straightforward theme for WordPress comes equipped with: a responsive and Retina-ready layout, a filterable portfolio, multiple page templates included, and much more. 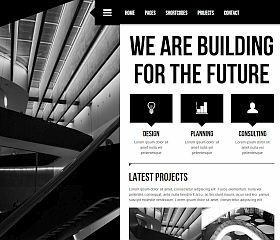 Domik is a theme for architects or architecture-related sites that delivers a clean and professional design that your visitors will love. 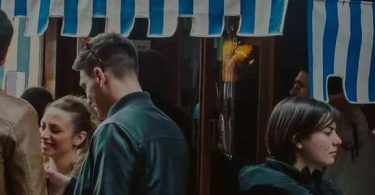 The full-width homepage features multiple formats that can display either a full-width image or even a full-width background video. 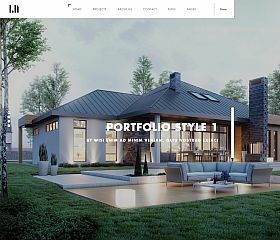 Additionally, the theme comes set up with: animation effects for page transitioning via AJAX, 4 unique home page layouts, multiple portfolio layouts, unlimited color schemes, and dozens of other options and features. 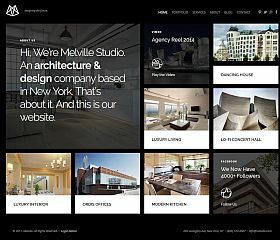 MIES combines design and usability to deliver a truly outstanding and unique portfolio architecture theme for WordPress. With a full-width background, parallax design elements, modern styling, powerful and robust built-in portfolio, responsive layout, speed and SEO optimized, built-in shortcodes, and the included PSD files – it’s everything you could want from a professional and state-of-the-art design. 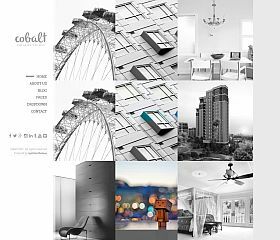 Cobalt takes a unique approach to the design of your architectural site by laying out your content in a portfolio-style layout. 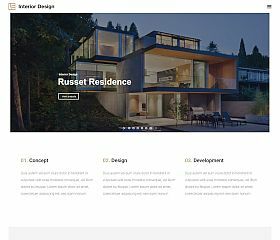 Show off your latest projects and clients, in this feature-packed theme that includes: responsive layout and design, 12 unique color schemes, multiple page templates, multiple portfolio and blog styles/layouts, Visual Composer ($30 value), Revolution Slider ($19 value), custom theme options panel, and free HTML template. 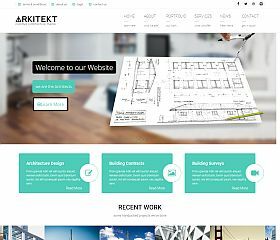 Arkitekt is one of the most robust and powerful architect themes for WordPress available on the market today. It includes: Visual Composer (a $30 value), Revolution Slider ($19 value), full-width featured content slider, sections for testimonials, staff profiles, standard blog section, portfolio, and many other options and additions that make it a great-looking theme that provides a lot of value for the price. 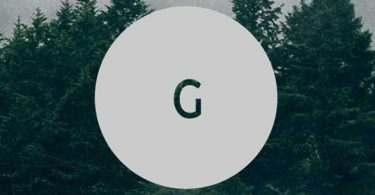 Rayleigh is one of the most visually appealing and striking themes in this roundup. Very simple and elegant in its design, it offers a clean and uncluttered look that will create a lasting impression with your site’s visitors. The minimalist qualities are present throughout, from the stylish menu to the nearly full-screen image that is first presented to your visitors on the homepage. 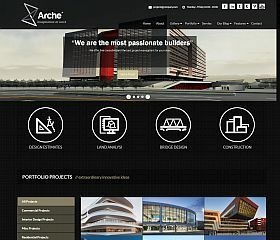 Arche is a business theme for WordPress that was built with architecture firms, agencies, offices, and businesses in mind. The homepage features multiple content sections which provide you plenty of room to display your current projects and clients, multimedia galleries, a full-width photo slider, and several other features and enhancements that those in the industry will love. Arctic delivers a very modern-looking design that will appeal to even the most style-inclined visitors to your site. With a full-width image that entices your guests with a large call-to-action button, it gives you a great-looking and functioning site without sacrificing design. 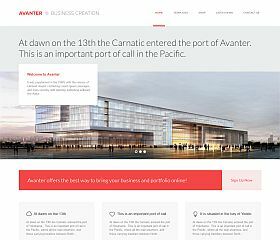 Avanter is a WordPress theme for architects with a design that conveys professionalism and will keep you current with the latest trends. 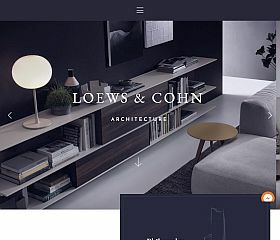 With its flat-style design, full-width photo gallery slider, portfolio and blog sections, and even the ability to integrate an online shop built into the functionality – it’s as robust as it is aesthetically-appealing. It works well for architects or any other corporate-style design needs you might have. 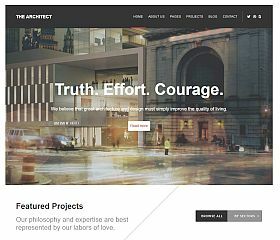 Arc is a theme that is as unique and eye-catching as the architecture that its content highlights and provides one of the most visually-unique WordPress themes on this list. It features a full-screen, responsive layout that prominently displays your photos via a homepage image slider and a sticky navigation menu makes browsing your site easy for visitors. Architecture was designed for those in the architectural field who are looking for a business or professional design to match the services they offer. A large and prominent, full-width featured content slider greets visitors to the homepage, while the rest of the content area provides plenty of room for recent news, projects, clients, or any other information you might want to display. 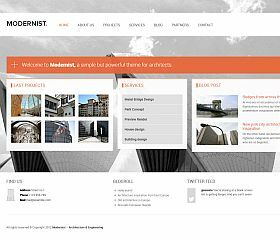 Modernist is a WordPress theme that has been specifically designed to cater to those in the architecture or architectural field. This flat-style WordPress theme incorporates a multitude of features and options that allow you to easily customize the theme to your liking. Fun animated effects, a portfolio section, full-width layout, and a homepage parallax effect contribute to making this a great and professional-looking option for any type of business or corporate website. Archos has multiple homepage layout options to choose from, and this theme gives you plenty of options to lay out your site exactly how you want to. From full-width pages that feature large images to the responsive design, it has features and extras that will help make your site look world-class. 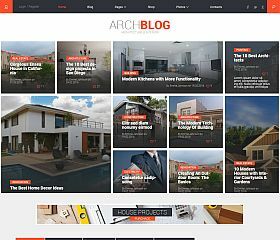 ArchBlog is for those wanting to set up a content-driven, architecture website or blog. Designed for promoting your content, it can work beautifully as a blog, portfolio, or combination of the two with features like: WooCommerce support/integration for selling things on your site, built with Bootstrap, custom widgets, AccessPress Social Counter included, support for MailChimp, responsive layout, and more. 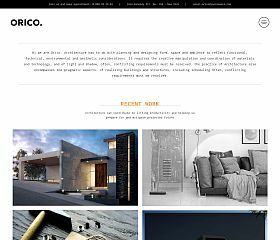 Orico is simple enough to be used for a single architect yet powerful enough to meet the needs of larger architectural firms, this theme that is both stylish and professional. Display the information most important to your visitors, while sharing the content, images, and work in an easy-to-find manner. 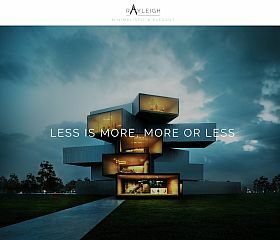 Ratio offers 15 different predefined styles to choose from, as well as plenty of options to create a great-looking architecture site. Barch is a theme that offers many different features and options to choose from in addition to the powerful portfolio, it excels at displaying a portfolio of your products, services, projects, clients, or anything else you might want to show off. 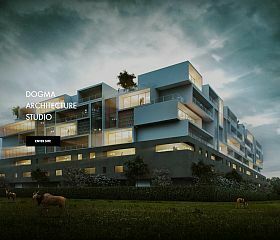 Dogma is a beautiful theme in every aspect, built for architectural studios wanting a very artistic and eye-catching way of sharing their content and information. 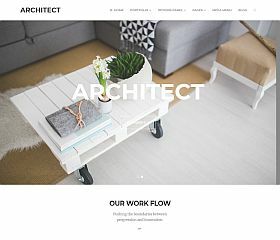 Anchro features an attention-grabbing layout, beautiful fonts and typography, css animation effects, and ease-of-use – this theme would make a great choice for anyone in the architecture industry. 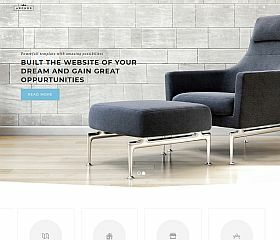 Interior Design is a theme for WordPress that is able to accommodate the needs of many different types of websites, this multi-purpose, responsive design includes a portfolio, blog, website, and even online shop – making it very adaptable and give you the features and look that you’re wanting. Firenze comes equipped with a one-of-a-kind layout that is sure to capture the intrigue and interest of your visitors, great for small architecture studios to global agencies. 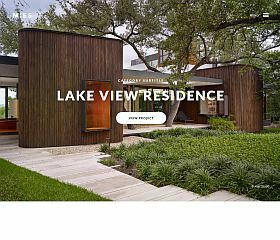 With 6 unique homepage styles to choose from (image, video, carousel, slider, slideshow, and multi-slideshow), multiple page templates for your portfolio, responsive and Retina-ready design, full-screen image and video background options, Ajax functionality, and other extras that will enhance your online appearance. 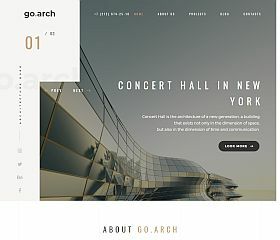 go.arch is a theme built for the interior design and architecture industry. It features a creative and bold design that has been optimized for speed and SEO – adhering to the latest web development techniques like HTML5 and CSS3. 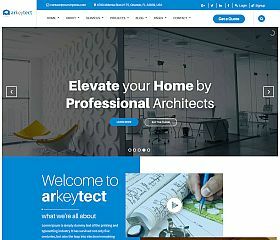 Arkeytect is WordPress theme for architects built with the popular Bootstrap 3.0 to ensure your site looks and functions professionally. It features $50+ in premium plugins, special features for testimonials, blogs, pricing tables, sliders, and more. 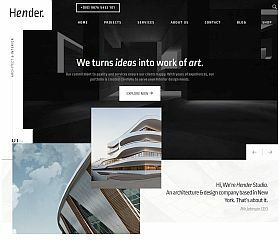 Hender is a powerful and multi-functional WordPress theme for agencies and businesses in the design and architectural field. With many custom options that allow for detailed customization, this theme also supports and integrates WooCommerce seamlessly – allowing you to not only share content and information about your company, but sell products and/or services online as well. 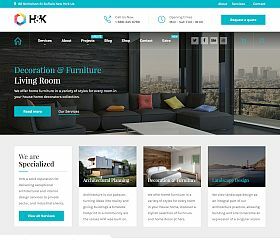 Hnk is one of the most complete solutions for creating a beautiful and user-friendly business site for the architecture and design industry. Functioning almost like an online store (which is possible with the WooCommerce support built-in), it offers you the perfect way to show of your work, clients, projects, and products. Whether you’re a landscape architect, small design firm, or large enterprise business – it offers nearly anything you might want for your site. 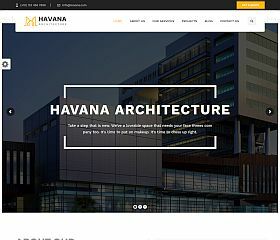 Havana works as well for an architecture site/business as it would a design firm. With a professional and modern design that leaves plenty of white space for a minimal look – it features a unique layout that is sure to capture the attention of your visitors. It’s responsive and Retina-ready, includes numerous theme customization options, and has been optimized for performance and SEO. 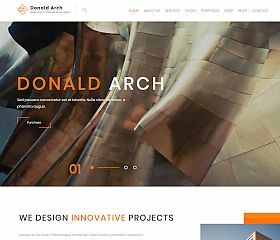 Donald Arch is a captivating and compelling choice for those wanting a truly modern and state-of-the-art template for their WordPress site. 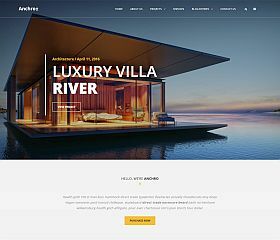 It was built using some of the latest web technologies and web development standards, including: LESS for CSS, a responsive layout and design that accommodates all screen sizes with ease, WooCommerce compatible, drag-and-drop page builder, built on Bootstrap, and dozens of other features have been built-in to the theme. 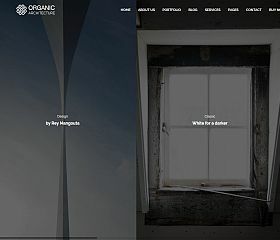 Organic is a portfolio theme that allows architects and achitecture businesses to showcase their portfolio, client work, projects, and skills. 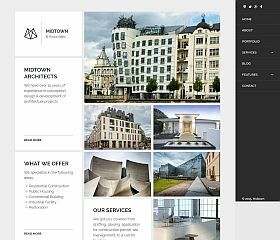 It features a masonry layout option, full-width/full-screen backgrounds, a responsive and mobile-friendly design, custom widgets and shortcodes, Bootstrap-built, and many other enhancements that give your site features and functionality not found in many other themes. 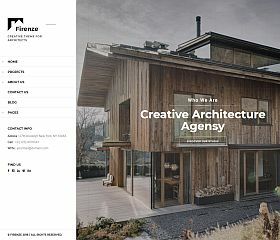 Whether you’re a large architectural firm, a solo architect, or even a freelancer – there are plenty of WordPress themes to choose from that will help convey a professional image while still maintaining the style and look that you want. From cutting edge designs to more traditional layouts, you’re sure to find a theme that matches your style.